For the price/alcohol ratio, I like this, but after that I get off the train. 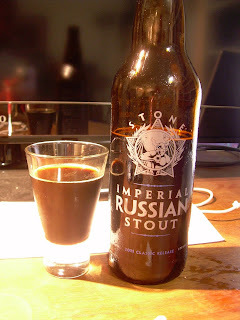 It's simply too imperial for it's own good, but maybe that's good for a cold night in Moscow. And I think I actually tasted paint in a few early sips, but maybe that's because I was huffing glue in a parking lot just prior. It seems obvious that regular Joe-the-Plumber type beer drinkers will hate this, but when I think about how Stone has always recognized that fact (just read any of their labels), it makes everything right again. At least they're not bullshitting us, right? I've got the Belgo-Anise variant of this waiting in the fridge, so we'll see how that changes the game. I'm already feeling buzzed - niiiice. I recently tried the Belgo Anise version of this and it was almost too much flavor to deal with at once. The first glass was intriguing and enjoyable more for the novelty than anything but the second glass was a bit too much.